Sometimes a written story or blog post creates itself and other times, you have to work a bit harder on the concept. The same can be said for sharing your stories via video or perhaps a better word would be Vlogging. “Trying to communicate on a personal level with your audience.” That is the common theme for blogging and vlogging and THAT can also be the most prominent stumbling block as well. Sure, your opinions and interests might be entertaining to you, but will it resonate with your readers or viewers? That can be hard to quantify. Well, not so hard really because YouTube, Vimeo and even Facebook all allow comments, likes and the ability to share and embed your blog, but I digress. Sweaty palms, nervousness and self-doubt are all normal characteristics that will occur to you before and after you publish your first vlog. One of the most famous vloggers in the world and my personal favorite is Casey Neistat. Ever heard of him? I had not until a couple of months ago, however, I’m glad I stumbled upon his amazing work. He’s an award winning filmmaker who switched from showcasing his work at Sundance and HBO and decided to go all in on vlogging. Wise choice I’d say because he just won the Shorty Award for YouTuber of the Year. I’ll save you the second hand details, if you’re interested, just start here. Back to cameras. Don’t worry about what you might not have when it comes to cameras. It might sound funny, but really, the camera or cameras you use are pretty much secondary to the story you tell. In addition, you would be hard-pressed these days to find a camera or smartphone that doesn’t shoot in high definition. So you’re already way ahead in that department. Personally, I shoot 80 percent of my videos on my iPhone 6s Plus. It is a fantastic camera and even shoots in 4k video. I also carry two GoPros with multiple attachments and an SLR. The later is great because it has an optical zoom. But, on the other hand it’s bulky. Plus, I have three young children so the GoPros and the iPhone fit my needs quite handsomely. The final bit. Just press record. Capture footage from all angles. Wide and close up. This will help vary your shots and put you on the right track to producing something interesting that people will want to watch. Trust me, everyone will have self-doubt and that’s okay. For instance, one of my wife’s first true vlog episodes revolved around, taking our daughter to get her hair cut. That’s pretty simple and one of many daily activities, which we all do. It’s also a topic that could make a fantastic video. See it for yourself. How did she do it? She captured all of the footage using her front facing camera on her iPhone 6 Plus. Jennifer is not a vlogger. Although there is talk between the both of us for her to start creating one on a regular basis. She is a makeup artist and beauty blogger. Sure, I edited the short video, but she was the one creating the content. I think Jennifer did a fine job for the first time around coming up with a story, getting the shots and finding a relatively simple ending to her story. Note: The only additional piece of equipment she used was a Joby Gorillapod, which I would highly recommend for anyone who takes video with their phone. 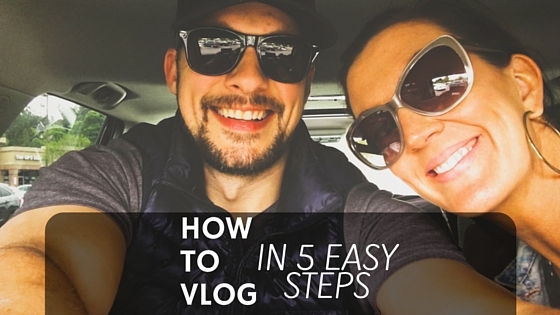 This might very well be the most important part of creating your first vlog entry. Your video footage can get pretty overwhelming. Especially if you go throughout your day shooting scenes here and there. For the above video, I think Jennifer recorded more than 20 individual video clips. The very best thing you can do is to immediately upload your photos to your computer and create folders. I prefer a simple timeline organization method of phrases, which leads me to my next video. Here is one I published last week. It was just a simple field trip that my daughter was taking with her school to Washington Farms, a local strawberry patch located right outside of Athens, Georgia. Listed below is an example of how I organized footage for this vlog that I uploaded on my YouTube channel. Allow me to explain my methods. I use the letter A and capital letters for the folder in which I’ll place my final edit, which will be uploaded to YouTube, Vimeo or Facebook. I use the letter P for photos. Not often, but sometimes, I’ll insert regular photos (or .jpg files) into my video edit. I like to have those available, yet separate. I use the letter V for video files. Notice that I gave myself a simple description, which will allow me to understand what is contained in the sub-folder. Note: If you need to make sure that your sub-folders line up correctly in time you can do one of two things. Check the “date created” column or place a letter like X,Y or Z before your description just to make sure it ends up at the bottom of your folder list since it is in alphabetical order. This is my organization system. It is efficient for me, yet might not be good for you. Just make sure to incorporate some type of organization. Terrible file management will not only make your life more difficult as it pertains to making videos, but might also cause you to abandon your entire creation completely. So, come up with a system that works for you. Sounds scary? It is if you let it scare you. I would venture to say that most people who don’t create videos, allow this step to kill any mojo they might have had in making a film. There are numerous expensive video editing platforms available. Two of the best are Apple’s Final Cut Pro ($300) and Adobe’s Premiere Pro ($200+ per year). While these are both fantastic and they both allow you to really push the limits of what you can create, they’re not necessary. If you have a Mac, then you should download iMovie. It is a relatively powerful platform that will completely amaze you with all that it can provide. It’s also relatively cheap. It might cost you $5 to $15 depending on whether you’re using the iPhone version or the full desktop version. Until the start of 2016, I created 90 percent of my films on iMovie. I now use Premiere Pro. I’m not going to lie to you, if you’ve never edited video before, using Premiere or Final Cut Pro will make your head spin. Learning any software or app can get very confusing and frustrating. It did for me when I was starting out over 10 years ago. But you will learn little by little and eventually, the comfort level will increase. Here is a video of our family spring break trip to New York City. It’s pretty good. I completed back in March. All of the footage is from GoPros and my iPhone. Coincidentally, it was entirely edited on iMovie. My best advice, for learning iMovie or any editing software would be to simply search relevant tips on YouTube. Find someone who explains it well, has a catalog of videos and stick with them. You can and will learn it. I for one, am wholly self taught with the help of YouTube videos and good ole trial and error. Besides number four, this can be the most daunting of all of the steps, but really is the easiest to do. Sure, there are some technical aspects to publishing your completed video, however, if you’re reading this article, I’m going to assume that you can navigate your way around YouTube and Facebook pretty good. YouTube is fairly straight forward in its upload process. The platform where people tend to get it wrong is Facebook. What do I mean by this statement? Well, take a stroll through your Facebook news feed and you’ll see a ton of video content. Look closer at some of the native video content and you’ll notice that the video quality is pretty terrible at times. But, it doesn’t have to be. Often times, users will upload their video or project via their iPhone or Android device and the video or vlog they post is not in HD. This is a problem because it’s 2016 and all of us are conditioned to view any and all films or video in high definition. Read my related post and you’ll quickly realize it is only a settings problem. Good luck with your vlogging. Don’t be intimidated. Press record and see what you get. The only way to get better is to keep trying. Going back to editing. With phone technology the way it is these days, there is really no reason for some, especially newbies to have to even lay eyes on a laptop or desktop to review, edit and upload their newly created vlog. One of my absolute favorite iOS apps (sorry Android users), is Vimeo’s Cameo App. It has a super-easy layout, Instagram like filters for your footage, great music options and simple editing functions. Plus, you can save your video to your camera roll, upload to Vimeo (obviously) and now with their most recent update, you can post to Facebook right from the app. Please read my post I wrote about Cameo here: “Cameo: The Mobile Video Editing App You Didn’t Know You Needed“. The video you see below was edited and published using just the Cameo App. Stay Little, Always from JaWaVi Films on Vimeo.